Cory Burns at the 2012 BFC with 2010 BFC Champ Dan Staffo and Dan Timmerman hot on his heels. Cycling & Athletic Experience: Cory came from long line of Alpine skiers. He was a downhill ski racer from age 7 to about 18, and his Dad was his coach. 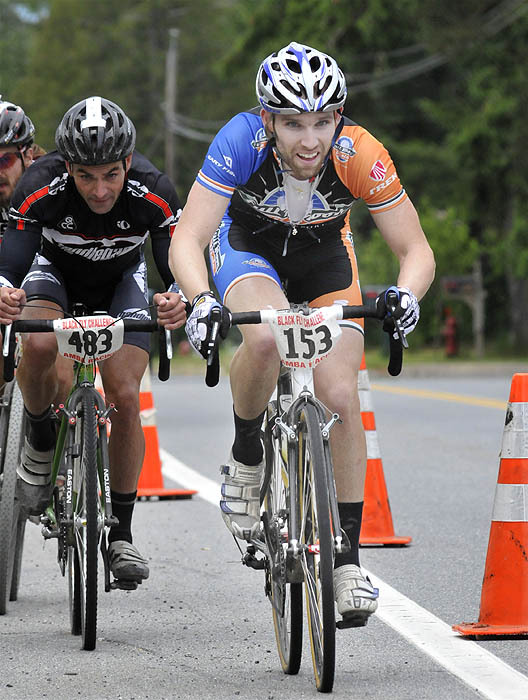 He has been riding competitively since about 15-years old, “I was a Junior mountainbiker up until I was 18 and transitioned into road (cycling) full-time.” He did a lot of road riding in college (JCC & UNH). Etc. : Rode most of the 2012 race with Dan Timmerman and (2010 Champ) Dan Staffo. Not happy that USA Cycling discouraging racers from doing unsanctioned races such as the BFC. How can we improve the BFC? “I don’t think anyone does a bad job there. It’s great and you wouldn’t have the numbers if it wasn’t.” Cory says some food and/or soda for riders would be nice and an earlier shuttle back to the start line would be good as well. And start the awards earlier.